It was once again memorable Masters week for all of us. Thanks to all participants. Hope you enjoyed as much as we did. We will inform about Masters2020 dates as soon as we get confirmation. Preliminary dates are 25.-29.3.2020 or 18.-22.3.2020 but we need to wait confirmation about other event dates for year 2020 before we update Masters2020 information here. You will find link to our photo gallery here. Password for photo gallery is kontu. Masters 2019 will take place 20.-24.3.2019. We will release official invitation in September. Thanks to all Masters 2018 participants. We had an excellent Masters week. We will inform you about the dates for 2019 as soon as we get confirmation for next season competiton calendar. Both waxings includes ski base cleaning with clean&glide, base waxing with righ temperature LF&HF glide waxes and coating (powder/block+liquid) with proper roller structure if needed. Waxing is made with Vauhti Wax Technologies's products. Basic waxing for skis 10€ (inc. cleaning, base waxing and liquid coating). Aku Moilanen, +358 40 8289624. Biathlon Masters will be held for the 21st time at Kontiolahti on 22.-25.3.2018. We have released official invitation and entry form now. You will find official invitation and entry form from INFO-page. WELCOME TO BIATHLON MASTERS 2018! Please note that BMW IBU World Cup 8 will take place at Kontiolahti Biathlon Stadium 6.-12.3.2017. If you are arriving already that week to Kontiolahti, please make accommodation reservations soon. Masters 2017 will take a place in 16.-19.3.2017. Official invitation will be released in September. Preliminary information for relay on Friday 18.3. Official invitation and entry form have been released 23.10.2015. You will find information here. 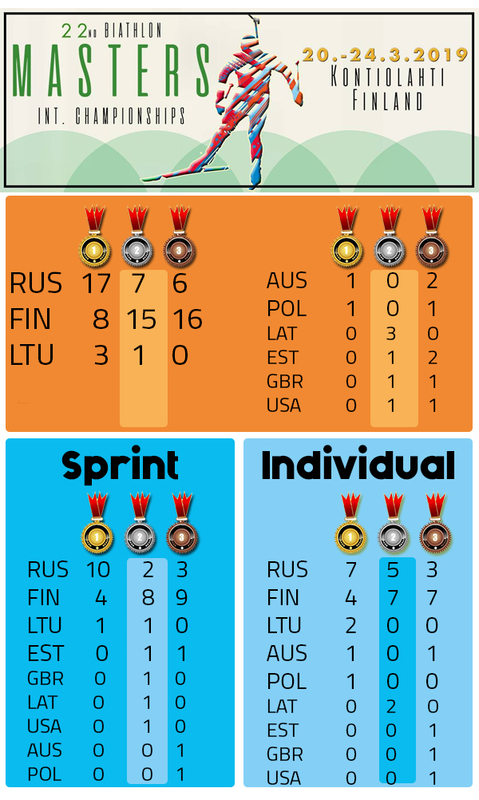 International Biathlon Union confirmed today new dates for Masters 2016. Masters 2016 will take place 16.-20.3.2016. Official invitation will be released later. Shooting analysis (individual) is available here. 18th Biathlon Masters International Championships will take place in 26.-29.3.2015 in Kontiolahti Biathlon Stadium. Official invitation has been released and you can find it from INFO-page. Masters 2014 was an excellent event. Three days of competitions, great gala night, old and new biathlon friends and and an extraordinary athmosphere. 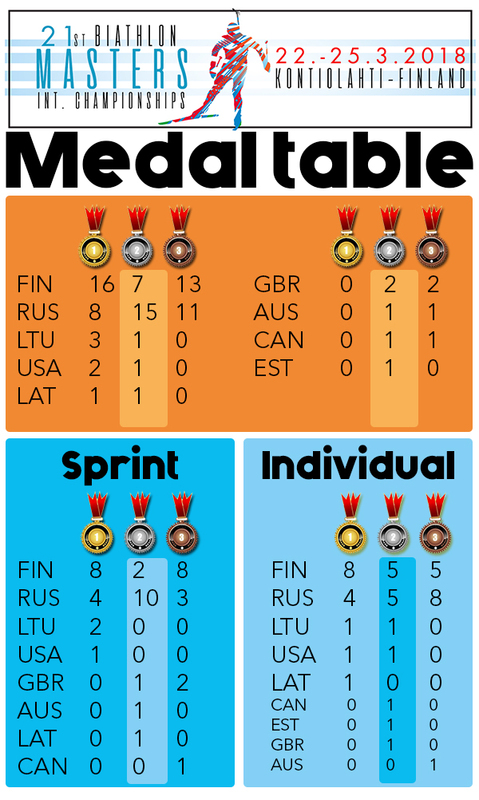 Ten nations and 149 biathletes took part to Masters 2014.